What is a human city? How do we define it, and what examples do we see in the world? How might each of us play a part in advancing human-centered development in cities? Join us to learn more about the Human Cities Initiative at Stanford, which delves into the heart of these questions through interdisciplinary curriculum, thought leadership, and collaborative research. The Human Cities Initiative seeks to embody an ethic of creativity, social commitment, and intention in the pursuit of research and real-world applications. In doing so, we practice ethical approaches using frameworks that are inclusive (for many) and participatory (by many), and strive to benefit human beings and their diverse communities. 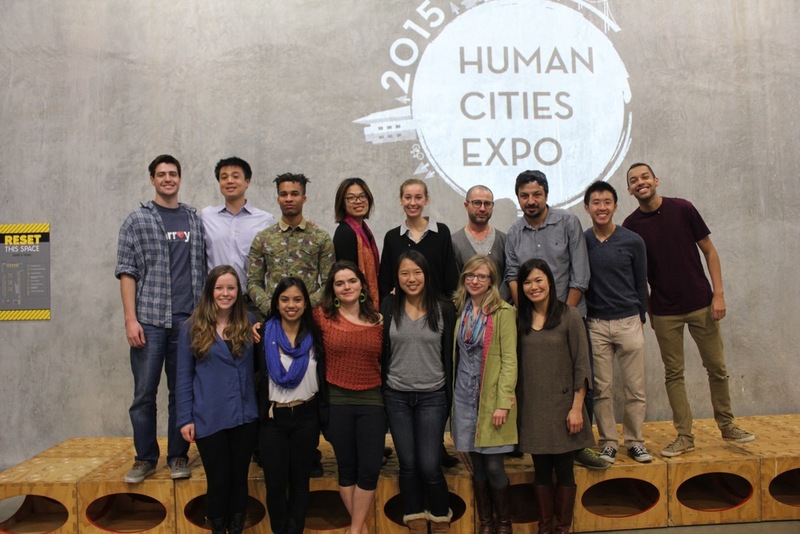 The Fall 2015 Human Cities Expo featured presentations and interactive exhibits from International Urbanization and Civic Dreams, Human Spaces. Lightning chats from scholars and expert practitioners will invite public comment and spark further conversation. Multinational teams from Stanford University and Tsinghua University collaborated on urban sustainability projects as part of the Approaching the Human City Workshop held in Beijing, followed by the International Urbanization Seminar spanning two continents in the fall quarter. Cross-cultural collaboration between students and community partners led to the creation of projects such as a public campaign addressing air pollution impacts on senior citizens; an exhibit at a community museum in a historic Beijing neighborhood; and a digital archive showcasing the evolution of Beijing's infrastructure network. Interdisciplinary groups from the d.school Civic Dreams, Human Spaces studio explored opportunities to enhance public spaces that encourage inclusion, ownership, and civic engagement. The class collaborated with the City of San Francisco to develop prototypes and social practice tools that inform municipal efforts along Market Street. Stanford Daily - "Urban Studies program launches Human Cities Initiative"
China Daily - "Two Schools' Goal: More Human Cities"